In 1820, the parishioners of Kempstone were able to pay for a new bell. There was no big landed family to cover the cost; they raised the funds, commissioned the work and the bell was put in place in the little tower. It rang out across the woods and fields to call the people to service; a modest thing, in comparison with the bells of nearby Great Dunham, Litcham and Beeston-next-Mileham, but no doubt they were proud of it. Perhaps this was also the time that the parish brought the church dedication into use; that kind of thing was popular with the early Victorians, although 'St Paul' on its own is an unlikely medieval dedication, so perhaps it had originally been to St Peter and St Paul. 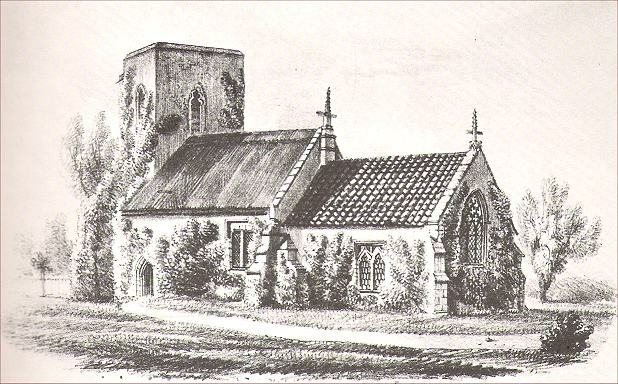 Ladbroke's drawing, from a decade or so before the bell was bought, shows Kempstone church in fine condition. But the 1851 census saw the population of rural Norfolk reach its peak. From now on, there would be a fierce haemorraging to the towns, and in parishes without clustered villages there was often a loss of all remaining sense of community. Without the will or the means to maintain the fabric, without the Victorian restoration that was so common almost everywhere, the condition of the church would deteriorate. This is what happened at Kempstone. In 1897, St Paul was closed. 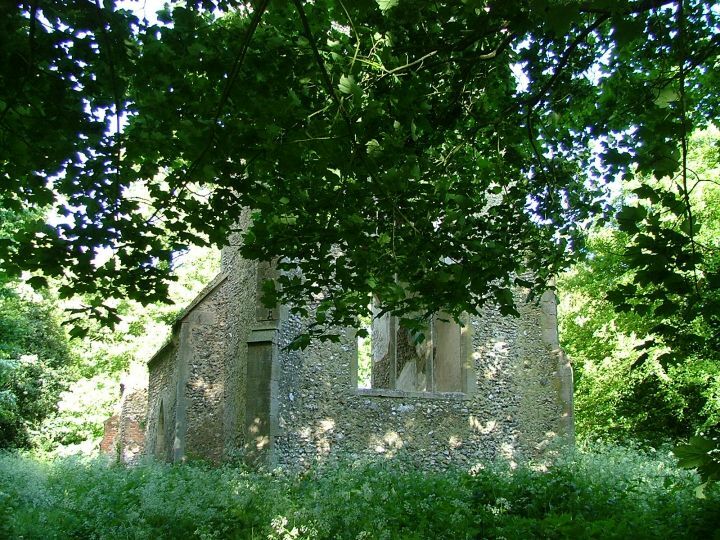 Parishioners walked across the fields to services elsewhere; they were still occasionally baptised and married here, but otherwise everything shifted to Litcham. 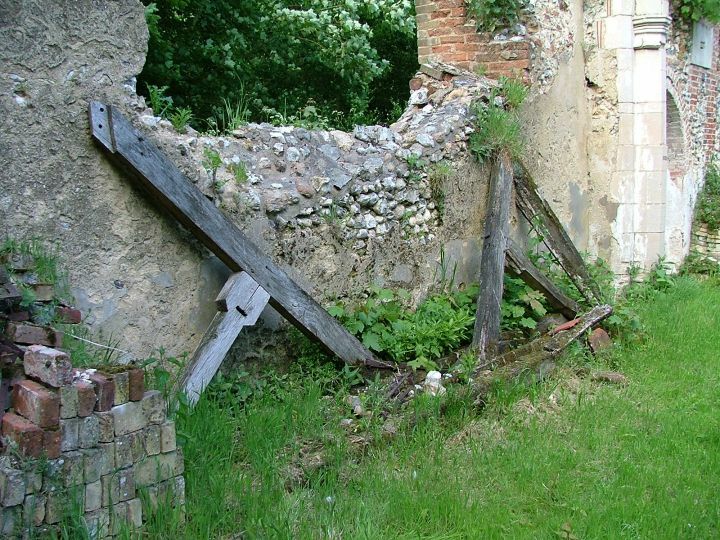 The building struggled on, becoming increasingly ruinous, until the travel restrictions of the Second World War effectively put an end to its life; something similar happened nearby at Houghton on the Hill. 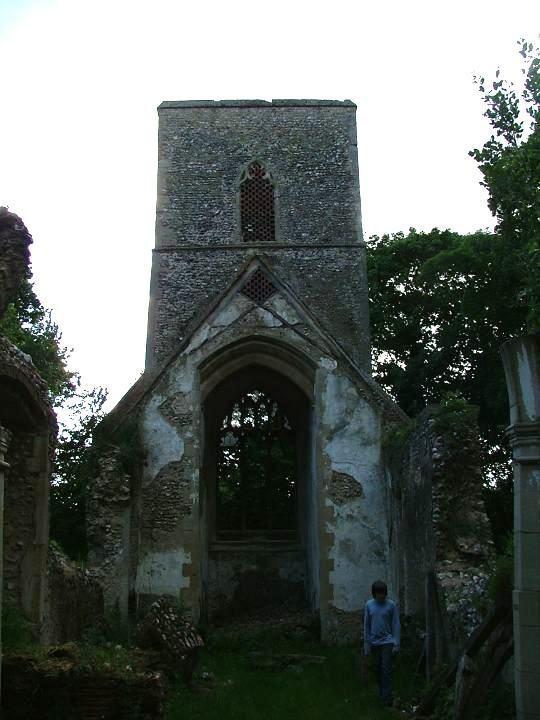 At the end of the War, diocesan architect Munro Cautley carried out a survey of Norfolk's churches. 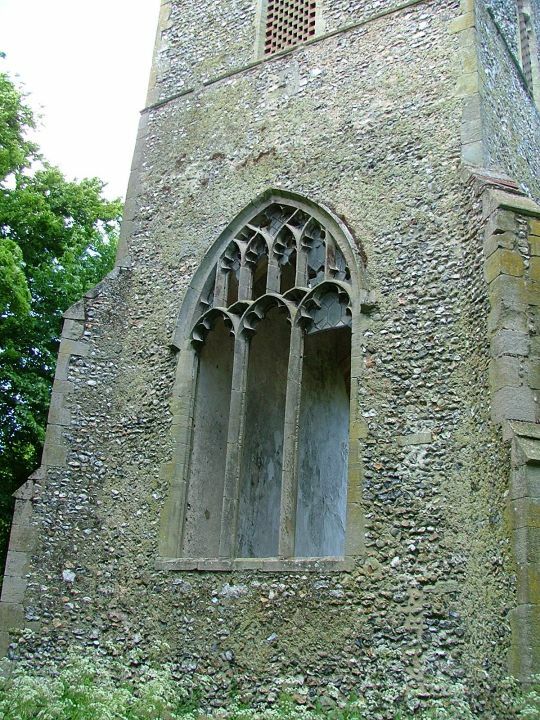 At Kempstone he reported that this derelict church has a 14c plain tower, a stoup inside S. door and a simple 15c font with traceried bowl and shaft. A few old 18c box pews, a simple trefoil headed piscina, Stuart rails and a 17c drop-handled bier, with the unusual feature of cross bearers at each end. In the years after the War, this part of Norfolk saw an intensification of large scale agriculture. St Paul is on private land, with no public footpaths coming anywhere near; the lanes around it were either ploughed under or left as farm tracks, none becoming public roads. The tree-surrounded mound of the graveyard, isolated in the fields, became overgrown. 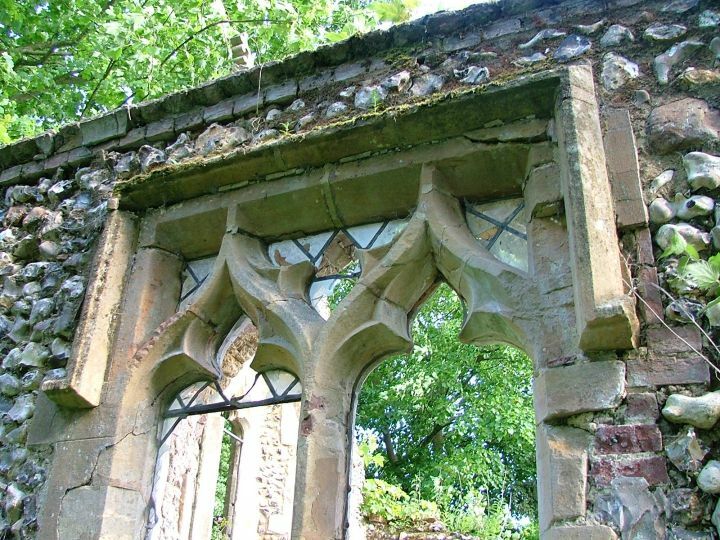 In 1957, Lady Harrod's Shell Guide to Norfolk reported that this disused church had a good 15th century chancel arch. In 1962, Pevsner found St Paul Disused and inaccessible at time of writing... FONT C15 with traceried stem and bowl. BOX PEWS C18. Bier C17. 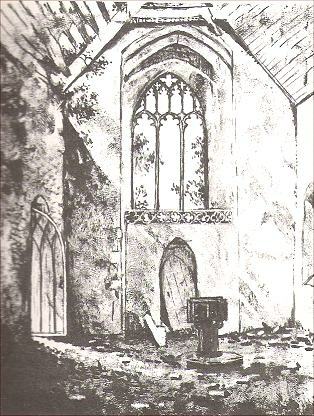 In 1972, an artist for Lady Harrod's wonderful Norfolk Country Churches and the Future visited, and depicted the west end of the interior still roughly intact; the font was in place, the tower screen still there. The glass had all gone, and daylight was beginnning to show through the rafters, but the nave at least still had its roof. 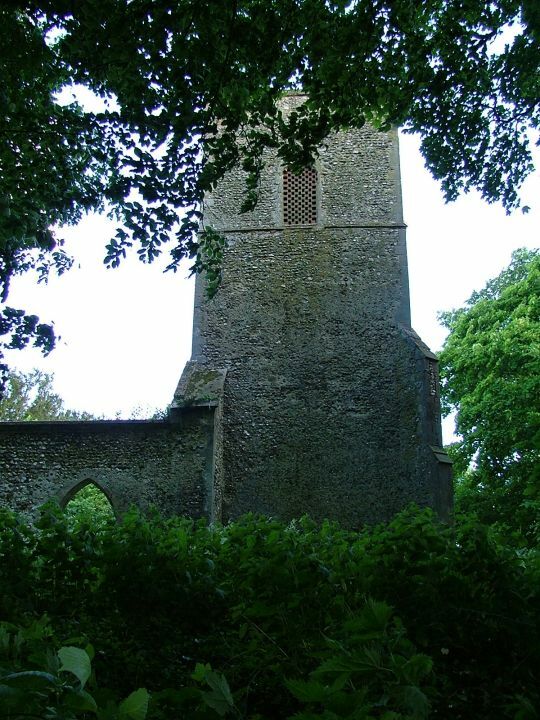 As far as I know, this was the last occasion on which anyone visited Kempstone church and then published an account of their visit, or described the condition of the church. 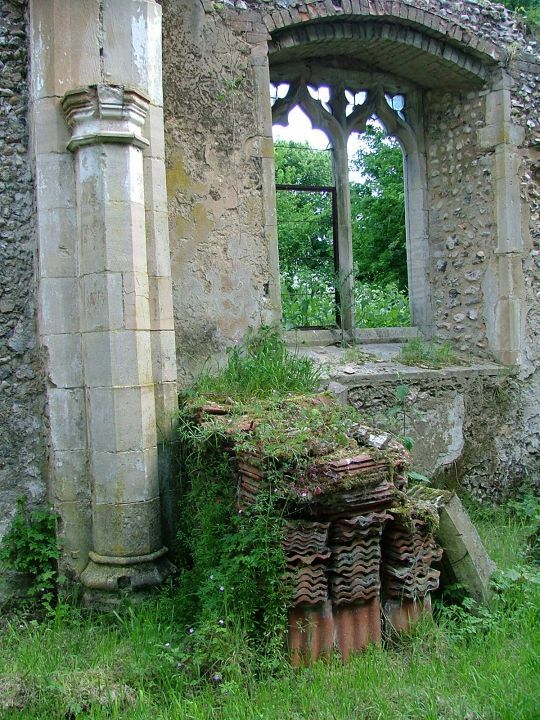 In the mid-1970s, St Paul was formally derelicted; the furnishings were taken out, the roof was removed, the tiles and timbers neatly stacked inside the nave; the brick floors taken up and similarly stacked. 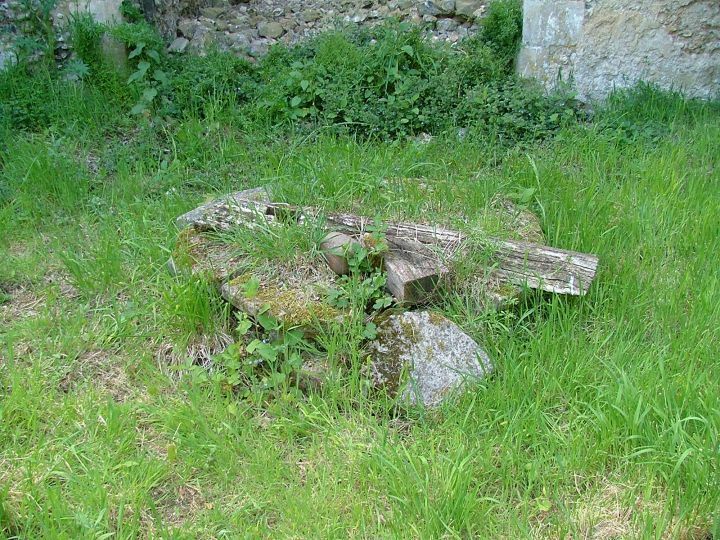 It was at this time that all the medieval apparatus of the church was removed. David Cawley, now a Vicar in Leicester, was Curate of Sprowston at the time. Writing to me in 2005, he recalled: I was a friend of the then Vicar of Litcham with Kempstone. We managed to get permission to remove the bowl and stem of the font, and to re-erect it in St Cuthbert's Church, Wroxham Road, Sprowston. You can still see it there. 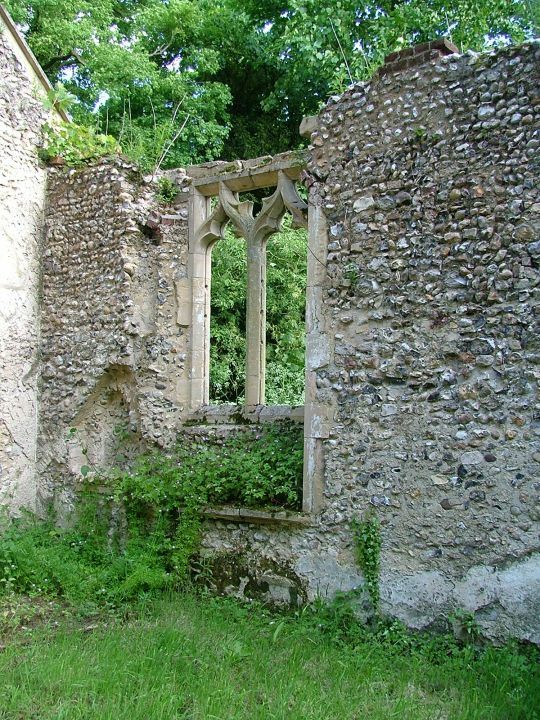 We also arranged to cut away the piscina and stoup from the south chancel and south porch walls respectively, and to take them to Litcham church for re-use there, and to remove a length of ancient panelling from the top of the modern screen in the tower arch, and to take it to Litcham. I take it that all these items are still at Litcham church. 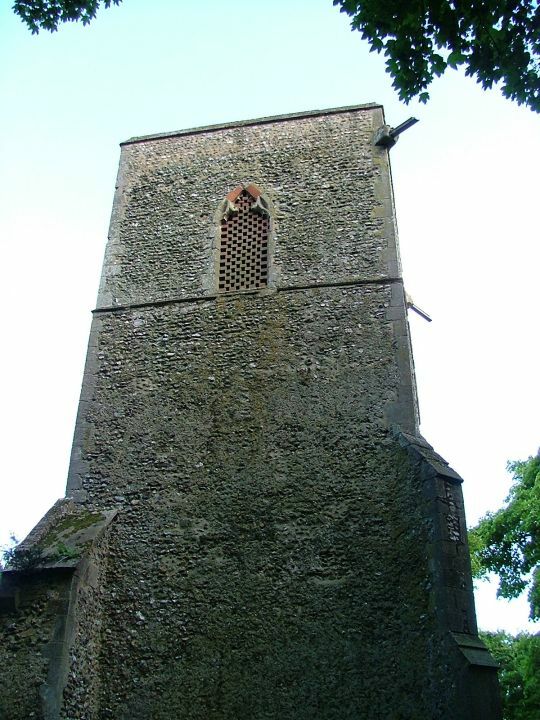 We got permission to lower the 1820 bell from the tower and to sell it back to the Whitechapel Foundry - the proceeds being used to assist with repairs to Litcham Church Bells. This was done, and as Litcham's bells had been silent for many years, it can be said that through them, Kempston's bell rings out. Bill Wilson, revising Pevsner in the late 1990s, obviously didn't visit. He repeats Pevsner's observation that St Paul is disused and inaccessible, noting the roof missing at time of writing... he takes Lady Harrod's cue and records the chancel arch with polygonal responds, but otherwise repeats Pevsner's inventory of the furnishings, adding that they are all now removed or decayed; presumably he didn't know which. I wasn't sure what inaccessible meant - was there a fence around it? It sounded more likely that the local landowners were not keen on visitors, and that was why Wilson had hedged his bets a bit. Then someone wrote to me, and told me that you had to apply for permission, that people had been turned back. 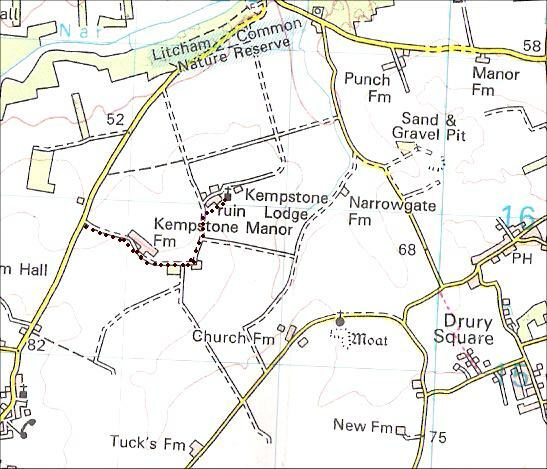 Looking at the ordnance survey map, I found the ruin at the meeting place of half a dozen farm tracks. Some of these barely even existed themselves; the one that runs from near Beeston-next-Mileham church is only discernible by its old gate and wheel ruts in the grass. 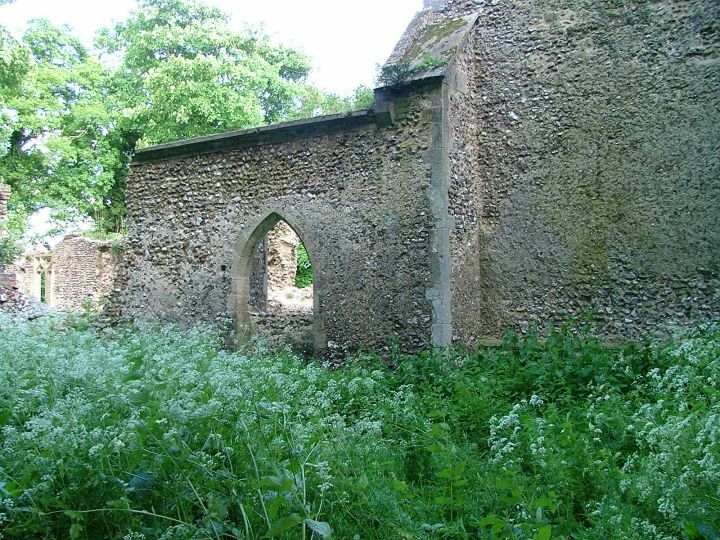 Bearing in mind that people had been prevented from approaching the ruin, that it was inaccessible, I dismissed the idea of using the approach that was closest to St Paul, from near Litcham. This is a track that runs up to some farm cottages and Kempstone Lodge. And then I noticed Kempstone Manor Farm. The Manor Farm is the largest of the dwellings in the lattice of tracks. I reasoned that the approach road to it was probably fairly major, and that beyond the farm I would already be on the other side of the ruin from the Litcham track. I would avoid the unpleasantness of someone trying to stop me, unless (and this was the beauty of it) I was already on my way back out to the road. The track to Manor Farm turned out to have a grand entrance, and was a new road, metalled in red sandstone. Jimmy and I wandered up, and, after a few hundred yards, we came to the farm. But, as the OS map had suggested, the track continued around the farm and into the woods on the other side. We kept walking. After another few hundred yards, we came to a group of cottages with wheelie bins outside; a hint of the absurd. An old gentleman was drinking a glass of beer in the garden of one of the cottages, and he greeted us cheerily. It seemed promising. The lane dog-legged to the north. The woods and copses opened up into fields - Kempstone is right on the edge of the chalk country, and high Norfolk was all beyond. The spire of Beeston-next-Mileham church was just a couple of hedges away. Alongside the next ploughed field, there was a track. We were now very close to where I knew St Paul to be, but I still couldn't see it. The trees were tall and thick, threshing in the heavy wind; did anything survive? We set off along the track, and in the far corner of the field there was a gap in the hedge, and a way across the ditch. A wall of trees was on the other side. "It should be here somewhere", I muttered, and almost at once Jimmy, ducking under a tree, cried "there it is!" He had spotted the base of the tower through the wall of green. We parted branches, and there it was. We pushed them aside with difficulty, clambered down into a ditch and up the other side into the boilings of nettles and cow parsley. We stood, breathing. There was St Paul; derelict, shattered, haunting. It was a tiny church. The north wall of the nave is pretty complete, that of the chancel crumbling. I could already see that Lady Harrod's chancel arch had fallen, probably before Wilson reported its existence in 1999. The piers are all that remain. 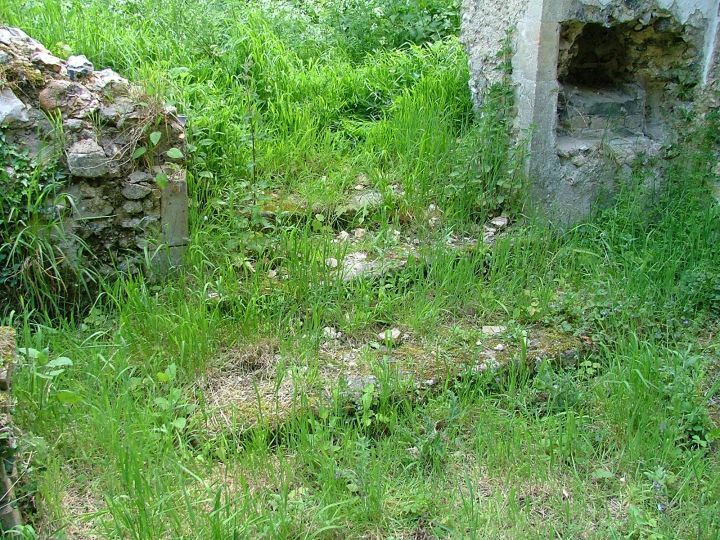 We beat a path up to the priest door, and climbed in.The first thing we noticed was that we were not the first visitors this spring, because someone had come and cut the grass back inside the ruin. So, someone still loves it. Otherwise, it is exactly as if it had been untouched since the dereliction in the mid-1970s. 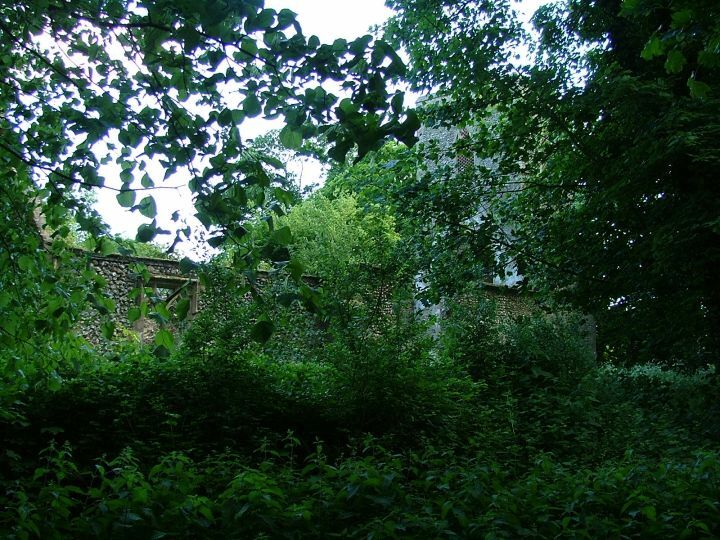 The stacks of roof tiles and bricks still sit quietly in their places, now overgrown. King posts from the roof still lean against a wall; one has fallen across the font pedestal. 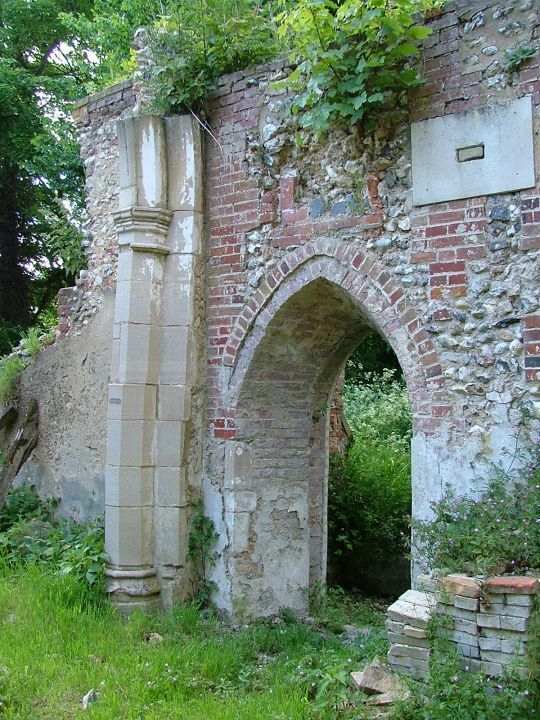 The chancel arch has collapsed, as has the arch above the south doorway and part of the north wall; but the rubble has almost all been cleared, as if a ghostly giant had reached in and taken it away. Writing in 2005, David Cawley told me that he first visited Kempstone in 1966, and then again in 1973. On the latter visit I noticed that the chancel arch was beginning to spread and the north wall of the nave was about to collapse. 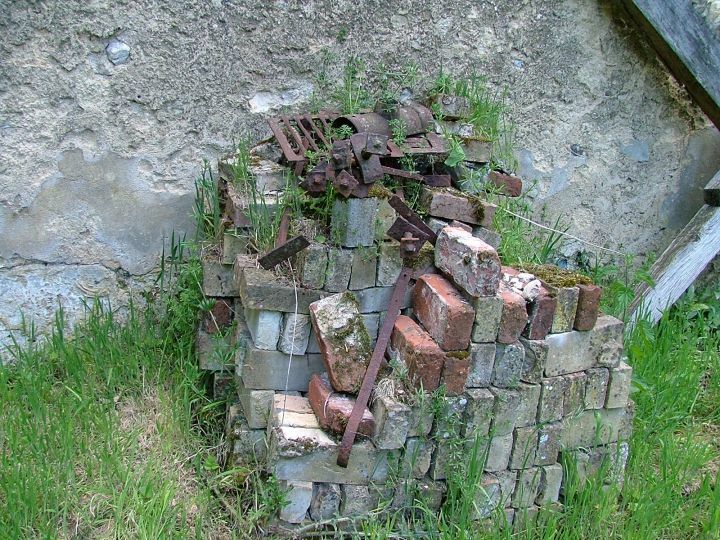 Under the tower, a heap of flint and broken tiles remain to remind us of the ultimate fate awaiting this building. We pottered and poked around, to see what we could find. So far from the road, so hedged in, the silence was full of the sound of birds and insects, of the restless trees tossing. 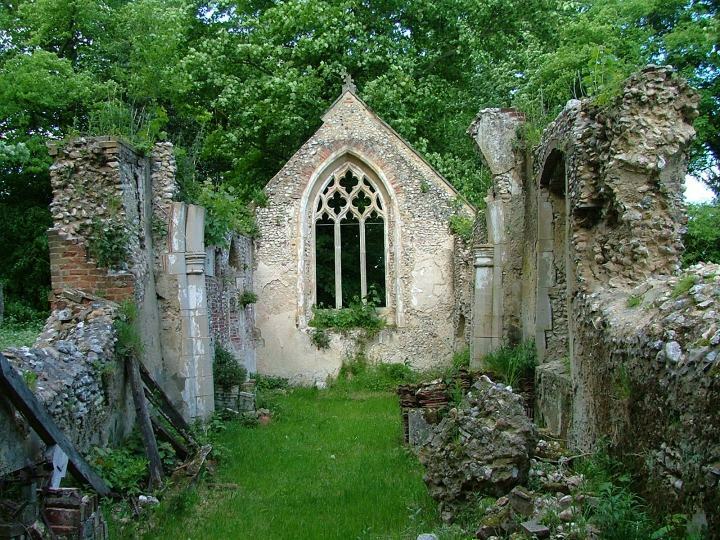 Nothing has happened here for so long, just this little church quietly melting away, going back to nature. I picked up a fragment of 19th century roof tile, and put it in my pocket, a keepsake. 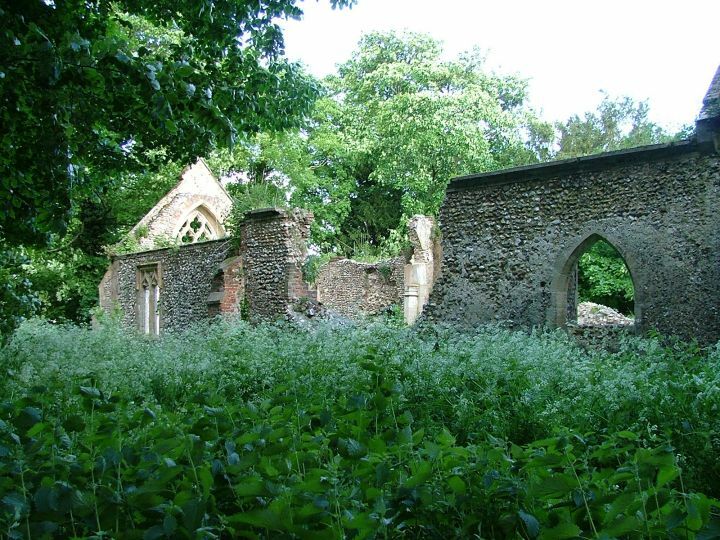 It seemed appropriate, because it isn't so much that Kempstone church is an ancient ruin, more that there is the feeling here of a Victorian community which dwindled and faded, hanging on for as long as it could. Farmworkers, cottagers, ploughboys, children; more than a memory, they still hang on in the bricks and the tiles and the roofbeams. They are barely out of sight. The ghost of their bell still rings across the fields from Litcham, is still audible here. 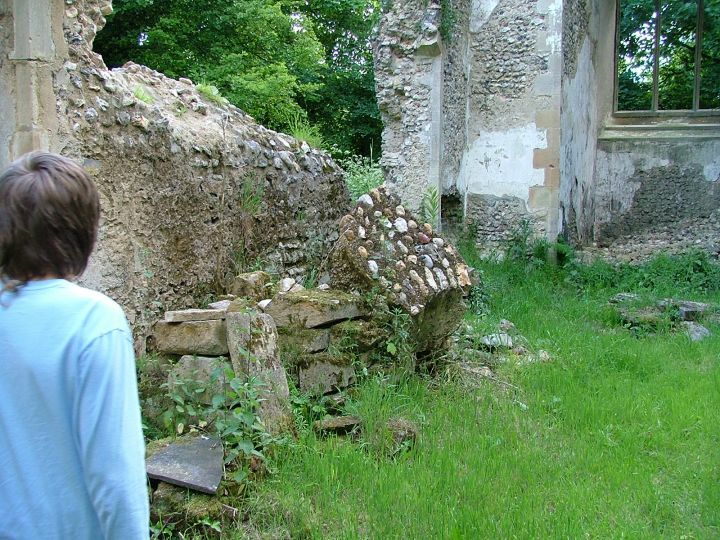 Jimmy and I just sat for a while; ruins make us quiet. And then, back the way we'd come, into the 21st century.